From left, Schulich MBA candidate Cortney Mills mentors high-school students Lashikan Rajanathan and Tyrel Bahadoor in Toronto. Their on-paper idea? A Wi-Fi router that doubles as a land-line phone and amplifies the wireless signal in a home. 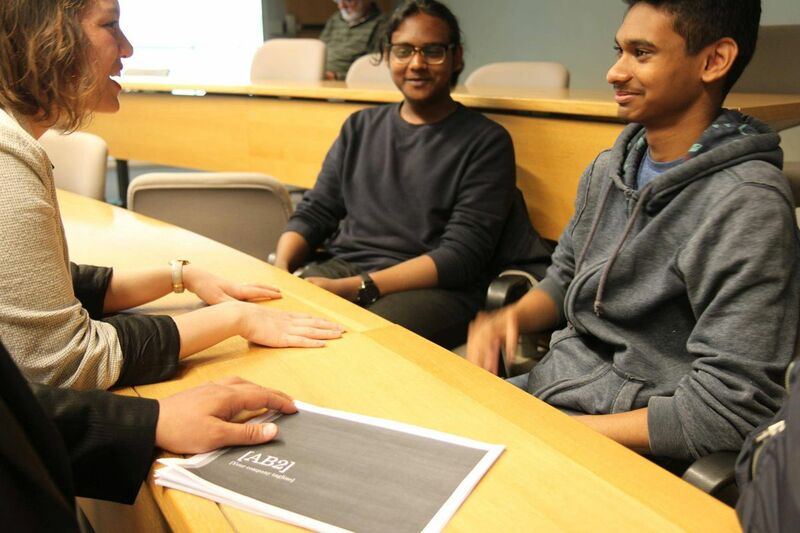 At York University's Schulich School of Business, three Toronto high-school students huddle with a mentor to review their progress in dreaming up a product from scratch. Their mentor, second-year Schulich MBA candidate Cortney Mills, peppers the students with questions about the cost, viability and consumer appeal of their on-paper idea: a WiFi router that doubles as a land-line phone and amplifies the wireless signal in a home. The exercise is part of a semester-long case competition of Summit Leaders, a non-profit set up last year by MBA students at the University of Toronto's Rotman School of Management, to expose high-school students from low-income neighbourhoods to the world of entrepreneurship and business. The competition expanded this year to include three business schools (in Calgary, Montreal and Toronto's Schulich) with support from McKinsey & Co.
"A lot of students don't realize this [business] is an avenue they can take and they are often the brightest people," says David St. Bernard, a co-founder of Summit Leaders who graduated this spring with combined degrees in business and law at U of T.
"Sometimes they need that little push," he says of the younger students in the program. "Our idea is to give them the avenue to open up their ideas and create more connections within the community." Students do not have to choose a business career, he adds, "but at least we give them the opportunity to choose." At the Schulich event in late May, the high-school students are members of the Grade 11 marketing class of teacher Grace Steele at C.W. Jefferys Collegiate Institute, in a "priority" neighbourhood (identified for additional services) a five-minute drive from the York campus. "It's been a wonderful, fantastic experience," says Ms. Steele, of the Summit Leaders program. "It allows them [students] to make more of a connection between the subject of marketing they are learning in school and the real-world application." A longer-term ambition of Summit Leaders also is to promote diverse workplaces and boardrooms. The ethnic diversity of program mentors sends its own message to the high-school students, says Mr. St. Bernard. "Students need to see people who look like them doing these things," he says. "You need to give them good examples." Lashikan Rajanathan, whose team dreamed up the souped-up WiFi router concept, acknowledged the rarity of being mentored by slightly older students who have chosen business as a career path. "I want to go on to marketing so it is a good opportunity to expand my knowledge." Teammate Tyrel Bahadoor adds: "I want to be an electrician. If I run my own business I might have to know how to do revenue, cost and income." Azelefa Khan, another member of Ms. Steele's class, says the regular mentoring sessions foster a no-risk environment to discuss ideas for new products and services. "Everyone respects your ideas even if they are a little weird," she says. Her team brainstormed the competition's (on paper) winning idea – a sleep mask for people who work irregular hours with built-in alarms and an eye mist to soothe sleep-deprived users. Through the semester, she says she learned how to build an idea from scratch. "In the beginning, our idea was not that strong but as we talked about it, it became a really good idea and I feel like it could actually work in the market." Schulich MBA candidate Sasan Zadeh, who helped to recruit 15 fellow classmates for the Summit Leaders program at his school, says the mentoring opportunity was what most appealed to him. "When the idea was first pitched I thought about myself when I was at their age," he says. "I thought if I have this opportunity to work with a big consulting firm [McKinsey] I would have jumped on it. I was seeing myself in their shoes." For mentors like Ms. Mills, the experience of giving back to a community – in this case high-school students – is consistent with her business education studies. "You can make as much money as you want in life and succeed as much as you want, but if you are not giving back to your community you are not creating any kind of holistic circle," she says. "That is something Schulich really teaches its students: It is not just about profit, it is about the people you interact with and it is about the planet you live on." This fall, Summit Leaders will again be offered by MBA student volunteers at four business schools. Mr. St. Bernard says "we knew that partnering with other MBA programs would allow us to have a much wider, broader impact and hopefully continue to expand." The program's co-founders treated the non-profit organization like a startup, learning from trial and error to foster a sustainable organization. "We get feedback from the teachers, the students and mentors, and discuss how to make it better," says Jennifer Bates, a co-founder of Summit Leaders and a recent MBA/JD graduate from Rotman. "We are constantly iterating the next phase of development, so we are equipped with the ability to respond to new challenges and to grow." "We are on track with where we want to be and we see a lot of opportunity to grow." Editor’s note: An earlier version of this story incorrectly stated that KPMG is working with Summit Leaders. In fact, McKinsey & Co. is the consulting firm working with the non-profit.